Cheap Plonk Never Tasted So Good. Wine snobs insist that wine must breathe to achieve a proper taste. To this end a vast array of contraptions and protocols have been devised to aerate your favorite vino. These rituals are usually bulky, messy and/or seem to take all weekend. Most of us just don’t have time for all that fuss. Besides- how much better can it really taste? Then we were introduced to the Wine Shower. This simple little gadget just sits on your goblet, then you pour as usual. 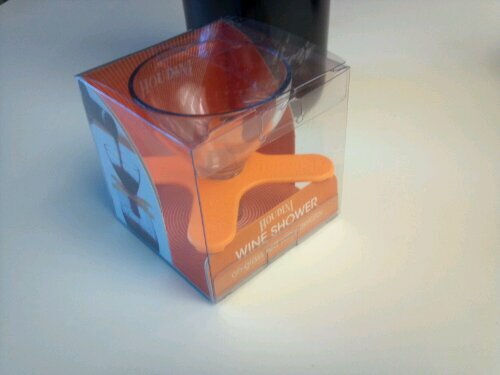 The wine passes through the funnel and “showers” into your glass. Even a ham-fisted doofus like me can operate it! The idea here is the gentle burbling of the red wine increases the flavor by introducing oxygen into the liquid. Typically this process involves decanting your wine into a carafe. And that’s way too time consuming when you just want to get your drunk on. But seriously, the Houdini on-glass aerator is clever, simple and even looks kinda cool. And while I’m no wine connoisseur, it really does seem to make the wine taste better. We have only discovered a couple of downsides so far. Like finding a place to put this thing after you’ve served up a glass. To avoid wine stains on the counter we use a spare wine glass or small bowl to park our bubbler. It’s also NOT dishwasher safe. But it is available in four different colors and comes in an attractive package.